On January 13 of 2014, everyone will know who will get crowned the best football player in the World by taking the FIFA Ballon d'Or 2013 home. Right now, no one doubts we have a 3-man race ahead of us, as Cristiano Ronaldo, Lionel Messi and Franck Ribery seem to gather the vast majority of the voters' preferences. Some of us might not like it for multiple reasons, but the naked truth is that the FIFA Ballon d'Or award still means a lot to most football players, may they admit it or not. On the 13th of January of 2014, FIFA will host their yearly ceremony for the Ballon d'Or 2013 and one of the big question marks is still to know if Cristiano Ronaldo, the main favorite to win this much-wanted award, will even attend the event. The Portuguese star felt highly disrespected when FIFA's president Joseph Blatter allegedly mocked him last October and because of that, he might not even travel to Zurich to be present at the awards' gala and ceremony. Nevertheless, he's the strongest contender to win this year's FIFA Ballon d'Or and that's why we've decided to compile a list with the top 7 reasons on why Cristiano Ronaldo should win his second FIFA Ballon d'Or of his career. We won't get a more straight and objective criteria than this. In 2013, Ribery scored 21 goals for Bayern Munich and France, Messi netted 45 for Barcelona and Argentina and Cristiano Ronaldo got 67 for both Real Madrid and Portugal. Only club friendlies records were stripped off from the stats above. 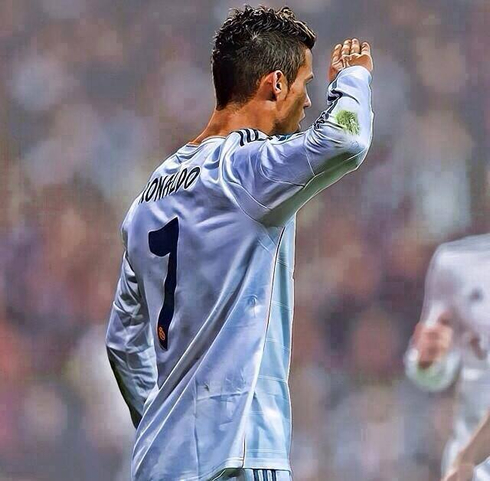 Basically, Ronaldo goalscoring tally (67) is higher than Lionel Messi and Franck Ribery goals combined (66). Certainly no one doubts that if it hadn't been for Ronaldo, Portugal wouldn't have made it to the World Cup. In 2013, CR7 scored 10 goals out of 9 appearances for the "Selecção", 4 of those coming in a decisive 2-leg playoff against Sweden. Messi in the other hand, helped Argentina with his fair share, as they easily cruised past almost every opponent they had to face at the South American qualification group stage. Ribery was also forced to go through an important playoff for France, but didn't exactly play a big part in France's 2nd leg comeback against Ukraine. Similarly to what happens with Messi at the Argentinian National Team, the Bayern Munich winger is also fortunate to be sided by more talented teammates than Ronaldo is in the Portuguese National Team. 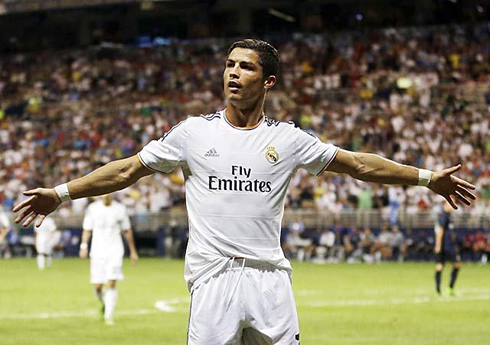 Here's another proof that Ronaldo has done it better than everyone else. The Real Madrid forward finished the last Champions League campaign (2012-13) ahead of all competition, with 12 goals scored during a Merengues campaign that resisted until the semi-finals clash, where they've ended up losing against Borussia Dortmund. 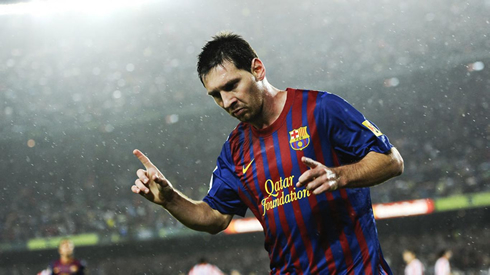 Messi was 3rd on this particular record, after having netted 8 goals. However and what seems to have been forgotten by many, is that Franck Ribery has only scored 1 goal, despite Bayern Munich having clinched the Champions League trophy in May. Some of you might immediately argue that the FIFA Ballon d'Or shouldn't only take into consideration how players perform from January to May and that we should also focus on what these players have done at this season's edition. Well, if that's the case, than Ronaldo leaves no room for contest. CR7 is once more this year's top goalscorer in the UEFA Champions League (tied with Ibrahimovic), after having scored 8 goals in the 4 games he has played so far. Messi comes behind on 3rd place with 6, while Ribery didn't get more than 3 goals thus far. It usually means something, as it's supposed to reflect the real chances each player has of winning the FIFA Ballon d'Or. Unlike the other "reasons", this one is actually more of a consequence of Ronaldo's favoritism rather than a factor weighing in at the FIFA Ballon d'Or decision scale. Still, when the market shows off its expectations in such a clear manner, it might affect the voting intentions from the undecided people, may those be the national team captains, coaches or the journalists across the World. On the day we've crossed the voting deadline (November 29), Ronaldo odds to win the FIFA Ballon d'Or were stacked at 1.25, while Messi and Ribery both had a payout factor of 6.00. Things have slightly changed in the last days, but Ronaldo keeps being the favorite with odds set around 1.60 as of today (December 5). Ininitally, FIFA had announced that the last day for journalists, national team captains and coaches to all cast their votes for the Ballon d'Or 2013 winner was October 15 of 2013. However and for the first time since we can remember, they've decided to extend the deadline for two more weeks, in order to allow that the 2-leg playoffs for the 2014 World Cup could still weigh in the decision process. It turns out that Ronaldo simply demolished Sweden in those playoffs, first by scoring the winning goal in Lisbon (1-0) and then by netting a memorable hat-trick in Stockholm (2-3), becoming the hero everyone in Portugal always hoped he could become. If this deadline extension has benefited anyone at all, it was undoubtedly Ronaldo, since Ribery didn't have much influence in France's win against Ukraine and Barça's Lionel Messi didn't even play during this period due to an injury. There is no other player in football history who has been considered/voted the 2nd best player in the World (on a calendar year) for so many times as Cristiano Ronaldo. We're taking into consideration the old France Football Ballon d'Or [1956-2009] and FIFA World Player [1991-2009] awards, as well as the new and merged FIFA Ballon d'Or [2009-2012] trophy. If we do account exclusively for the Ballon d'Or results (and ignore the FIFA World Player results from 1991 to 2009), Cristiano Ronaldo has finished in 2nd place for 4 times already. If we decide to account for the FIFA World Player results between 1991-2009 instead of the old Ballon d'Or on that very same period, Ronaldo ended up earning 3 second places. In either case, no other player in the World has ever finished second more than 2 times, regardless of the counting system. Now you may legitimately ask how does this actually play in Ronaldo's favor to win the FIFA Ballon d'Or this year and here's why: Never before has Ronaldo impressed so much throughout a calendar year as in 2013, especially as he managed to perform at his very best level both on club and national team level. If there's a year where he has outdone himself, it has to be this one (even more than in 2008, which was when he won his first and only FIFA Ballon d'Or trophy). If he finishes 2nd again after all he has done in 2013, then it seems safe to say that he will never win this award again. And just a quick reminder, people are supposed to cast their votes based on these players' individual performances throughout the year and not the titles each one has won, otherwise we'd have to necessarily be talking about 3 Bayern Munich candidates instead of Ronaldo, Messi and Ribery. #7 - The "Blatter effect"
On October 25, FIFA president Joseph Blatter attended an event at the Oxford Union Socity, together with a short panel of journalists and students. 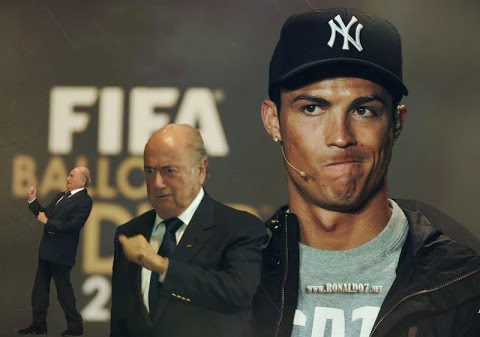 When answering one of the questions that had been posed to him, Blatter decided to attempt to impersonate Cristiano Ronaldo and make him look like a military commander. His performance was regarded by many as a tremendous act of disrespect towards the Real Madrid star and there was a big wave of consternation against FIFA and its president, right after the footage became public. As a direct result of this, many people who had always been neutral towards Ronaldo's claims about being treated unfairly by FIFA over the past years, suddenly decided to back up and side with Ronaldo. It seems only legitimate to think that among these people we can actually include some of the national teams captains, coaches and journalists that have already casted their vote for the upcoming 2013 FIFA Ballon d'Or. 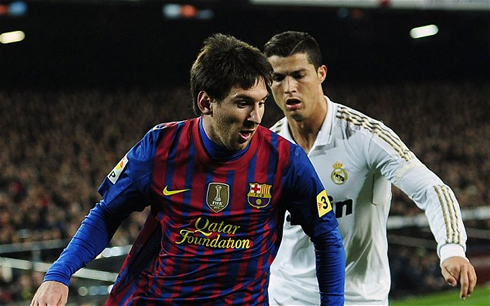 The FIFA Ballon d'Or 2013 ceremony will be held in Zurich, on January 14, 2014. Whatever the outcome will be, one thing we can all be sure about. Ronaldo has already won the respect and admiration from those who really know how to appreciate football from a neutral standing point and at this stage, no one certainly doubts that he'll go down as one of the greatest football players to have ever stepped onto a football pitch, whether he finishes his career with one Ballon d'Or or a handful of them. This article was brought to you by Ronaldo7.net. 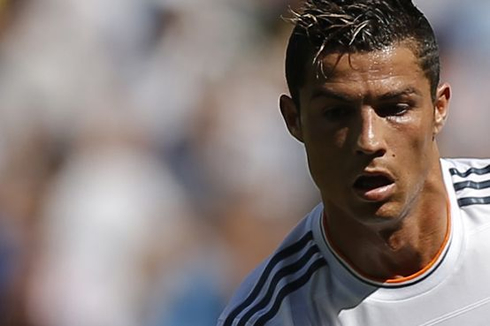 Cristiano Ronaldo is expected to return from his left thigh injury on the 10th of December of 2013, on the day Real Madrid faces Copenhagen for the final UEFA Champions League group stage fixture. Before that, you can watch Olimpic Xativa vs Real Madrid live, Cartagena vs Barcelona, Manchester United vs Newcastle and Stoke vs Chelsea, all matches provided from our football live stream section.